Please find below a list of the current courses and lessons I offer. For more information on special offers please contact me on 07960 010869. I currently provide driving lessons in the following postcode areas: RM1, RM2, RM3, RM4, RM5, RM6, RM7, RM8, RM9, RM10, RM11, RM12, RM13, RM14, RM15, RM16, RM17 and RM19. 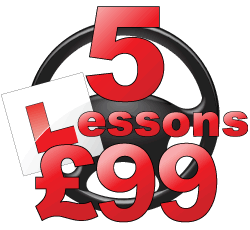 For a limited period only I am able to offer the first 5 hours of driving lessons for only £99 plus a free LD System Driving Skills workbook and online Theory access worth £20. Please also note terms and conditions below. Offer not to be used in conjunction with any other offer.